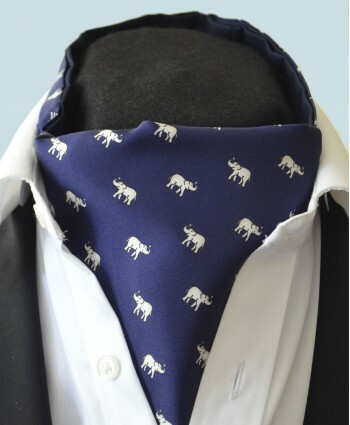 This classic self tie silk cravat features a neat pattern of white elephants with lucky raised trunks on a navy background.The cravat /ascot is hand-made in England using the finest quality Italian printed silk backed with 100% cotton for a cool and comfortable feel. Approx Size:Top To Tip: 48" (122cm)Widest Point: 6.25" (16cm)Dry Clean OnlyA donation of 10% of the purchase price of this fin.. 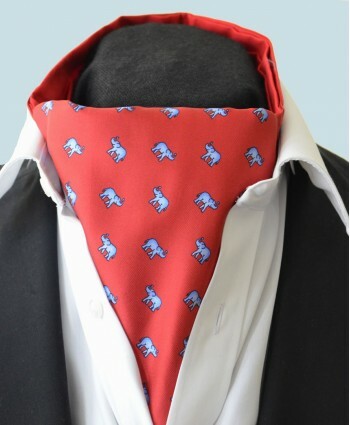 This classic self tie silk cravat features a neat pattern of light blue elephants with lucky raised trunks on a bright red background.The cravat /ascot is hand-made in England using the finest quality Italian printed silk backed with 100% cotton for a cool and comfortable feel. Approx Size:Top To Tip: 48" (122cm)Widest Point: 6.25" (16cm)Dry Clean OnlyA donation of 10% of the purchase price .. 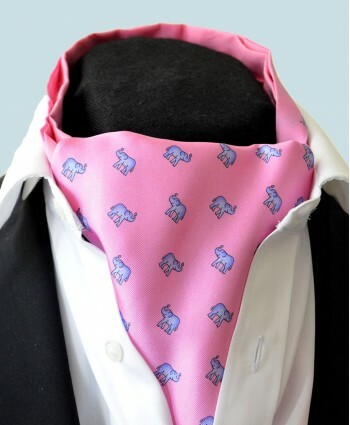 This classic self tie silk cravat features a neat pattern of light blue elephants with lucky raised trunks on a dusky pink background.The cravat /ascot is hand-made in England using the finest quality Italian printed silk backed with 100% cotton for a cool and comfortable feel. Approx Size:Top To Tip: 48" (122cm)Widest Point: 6.25" (16cm)Dry Clean OnlyA donation of 10% of the purchase price .. 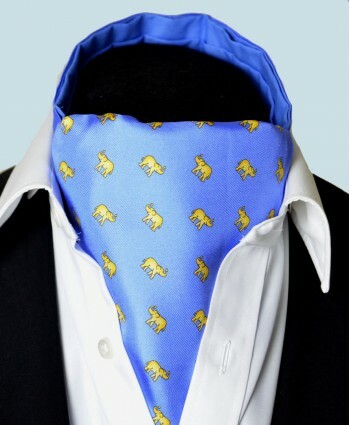 This classic self tie silk cravat features a neat pattern of sunflower yellow elephants with lucky raised trunks on a light blue background.The cravat /ascot is hand-made in England using the finest quality Italian printed silk backed with 100% cotton for a cool and comfortable feel. Approx Size:Top To Tip: 48" (122cm)Widest Point: 6.25" (16cm)Dry Clean OnlyA donation of 10% of the purchase .. 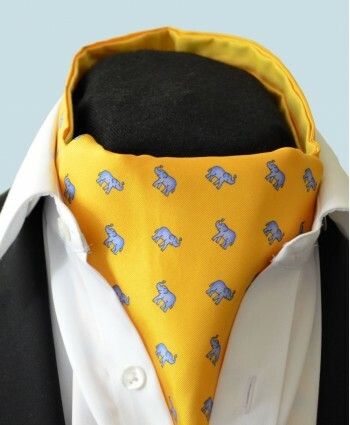 This classic self tie silk cravat features a neat pattern of light blue elephants with lucky raised trunks on a sunflower yellow background.The cravat /ascot is hand-made in England using the finest quality Italian printed silk backed with 100% cotton for a cool and comfortable feel. Approx Size:Top To Tip: 48" (122cm)Widest Point: 6.25" (16cm)Dry Clean OnlyA donation of 10% of the purchase ..